Hohner Marine Band Harmonica, Key of G. Hohner's diatonic harmonicas set the industry standard through their high quality construction, excellent response and unsurpassed tone. Richter tuning and undivided air channels allow for bending and overblowing the reeds, creating the signature wailing sound typical of the harmonica. 5 out of 5 stars - Hohner Marine Band Harmonica 1896BX in the Key of "G" + Bonus Hohner Mini Harp! 2 product ratings2 product ratings - Hohner Marine Band Harmonica 1896BX in the Key of "G" + Bonus Hohner Mini Harp! Hohner Marine Band 1896 key G Blues diatonic harmonica in great condition with a Hohner Blue Midnight MS hard case. The harmonica had been disassembled and Detailed Cleaned. It is very easy to disassemble with screws and the cleaning job is easy. THIS HARMONICA STYLE HAS BEEN AROUND OVER 100 YEARS AND WAS USED BY MANY FAMOUS STARS. THIS HARP IS IN THE KEY OF Ab OR G#. YOU WILL ENJOY PLAYING THIS GREAT HARMONICA. HOHNER MARINE BAND. KEY OF "Ab OR G#". Peer wood body. single note 10 hole 20 sound. wooden body. We may not be able to send it to countries which prohibit importing lithium. Instruction manual could be written in Japanese. Middle East. Vintage M Hohner Marine Band Harmonica #1896 w/ Box~Key of G~A440. Buyer pays for shipping. Email me with any questions. Thanks! Prewar Hohner Marine Band in the key of G. Taken apart, cleaned and put back together with screws for easy cleaning or setting up. Tines have been smoothed out. Comb has been sealed. Sanitised with Ozone. These are USED harmonicas in good condition. From the birth of the blues, the Marine Band 1896 has been a constant musical fixture. Includes Keys G, C and A. Keys C,G,A. Series Marine Band. Reed plate thickness 0.9 mm brass. Cover surface Stainless Steel. Trending at $116.62eBay determines this price through a machine learned model of the product's sale prices within the last 90 days. 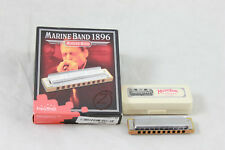 Hohner 1896 Marine Band Harmonica G. Condition is New. Shipped with USPS First Class Package. This bundle includes the world famous, German made, Hohner Marine Band harmonica in the key of G#, plus the wonderful little Hohner Mini Harp harmonica in the key of C. Hohner 1896 Marine Band Harmonica Features.